Here you will find a list events and activities scheduled for the future. I will update this page frequently, so check back often to stay up to date. Be there to relive the Summer Of 69, nay `84 - '89! Year 2009 - Silver Jubilee Celebrations! It's 2009 and the Silver Jubilee Year of the Class of '84! To commemorate this landmark event in our lives, we have planned a gala celebration by the beaches of Mahabalipuram and Thailand stretching over one week from 1st to 8th August 2009. Several programs have been planned. Please note the slight modifications in the program modules done on popular request. The programs have been structured in distinct modules to facilitate easy payment and also give a choice to those alumni who have time or other constraints. You can choose to attend all or any combination of modules. Alumni may attend any module with or without their families, though everybody would love to meet your dear ones. So start planning and get ready to revisit some of the most exciting moments of our lives and share and rejoice in our life's journey since college. Remember to spread the word around about our Silver Jubilee Celebrations. We have lost touch with some of our classmates and do not have their current contact information. Please inform them or send us their email ids, phone numbers, address or other contact information that you have so that we can invite them to attend and make our meet a fun get-together! Addendum: We have been overwhelmed by the huge response from our friends to attend our August 2009 batch meet; so have the original hotel/ resort gals and guys! As such they (the originally planned resort gals and guys) will not be able to accommodate all of us in the same property and offered to put the "later" registrations into a "near by" resort. 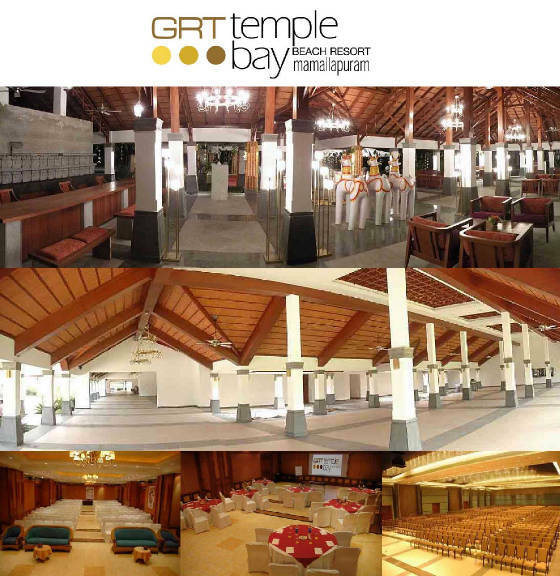 Since we were absolutely unhappy with their crazy idea of splitting our batch into two or more fragments (like A-batch, B-batch etc in college - bloody nonsense I say) we are moving the whole program to the fabulous GRT Temple Bay beach resort (see pics below), Mahabs. As such, please note the revised resort/ hotel tariff (between 0 and 10% upward only and definitely offset by the fantastic value additions!) and the name in which the crossed cheques/ Demand Drafts have to be made. Looking forward to the fun times! Note: Some of the pictures on this page are quite large and may take time to load. When you see the scroll bar on the side, scroll down to continue reading the text while the pictures load. Once the pictures are loaded you can scroll back and view them. If you see a lot of empty space when you are scrolling down it means a picture is loading there. Scroll down further and read the text. You can choose to attend all or any combination of modules. Alumni may attend any module with or without their families. The last date for registration and submission of cheques or demand drafts is 5th June 2009. This is the BIG one! Plan for it. or associate treasurers Dr.S.Ezhilarasi, Dr.Wahida Banu. On the back of each crossed cheque or demand draft write your name, number of accompanying persons in each age group, choice of veg or non-veg food and the break-up for the total amount you are sending. The concerned treasurer will confirm to you directly upon receipt of the crossed cheques/ demand drafts. There are no external sponsorships for any of the programs or events. Feel free to personally sponsor any event! Contact any of the treasurers for exciting details!! Payment for ActionNest (module 2) includes participation in JingleMingle (module 3) at no additional cost. No additional payment is necessary. Negotiations with travel agents are at an advanced stage and details will be available shortly. While some of our friends are coming with their spouse and children, a few are planning to come with their parents and some all alone. More the travellers, better the cost! The cost will be between Indian rupees 35,000 and 40,000 on a twin sharing basis for Indian passport holders. This is likely to vary depending on the cost of flight ticket etc at the time of departure. Foreign passport holders please contact DrLMurugan@yahoo.com for details. Please inform at the earliest how many members of your family will be coming to facilitate better financial deal with the travel agent. 1. The modules, programs, events, venues, tours etc have been planned/ modified based on popular request and any further requests will be met if feasible. 2. While all possible efforts will be taken to stick to the modules/ programs/ events/ schedules/ venues/ tours/ tariffs mentioned any/ all of the above may be changed/ cancelled due to factors that may/ may not be under our control. 3. The Treasurers have opened a new bank account with Karur Vysya Bank, Chennai to manage finances for the specific purpose of this event. All accounts will be duly audited at the end of the event and the report available on request. 4. Every committee member has individually stated that they or their beneficiaries do not personally benefit in any way (financially or otherwise) before, during or after our batch meet for their efforts in organising our batch meet. Each committee member will pay all applicable tariffs as everybody else. Please contact them personally for any clarifications. 5. While all efforts have been taken by the committee members to get the best possible tariffs etc., any alumni or their associate(s) who can get a better tariff/ deal is requested to contact any/ all committee member(s) at the earliest with their suggestions. If any of the payment information is confusing and you wish to check how much you should pay before you actually draw your crossed cheques/ DDs email us - DrLMurugan@yahoo.com (or) gkalavathy@yahoo.com indicating the number of persons accompanying you, their age and the modules you wish to participate in. If you have any special requests to make, travel or other arrangements you need assistance with, let us know in advance. Looking forward to the fun times! Please help us locate the email ids, mobile & landline numbers and addresses of our friends. The reunions are sheer fun. Don't miss the next one. Click on the link below to refresh this page. Obviously, you will need to be online!